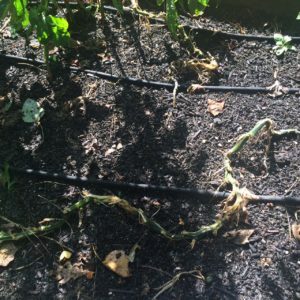 I’ve had the same problem for all three years of my garden. I do a good job of trimming plants and keeping them under control when they’re first growing. But about halfway through the growing seasons I think, I got this. The plants are fine. As long as they’re growing that’s good. Wrong. 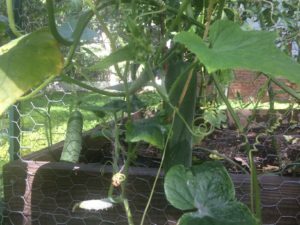 As in past years, I let my garden get out of control. In Steve’s words, my tomato plants “looked like a forest.” My plan was to train the squash to grow on a trellis but I didn’t quite get around to doing that. 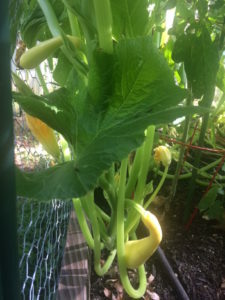 So right now, the squash has taken over the middle of the garden. If you don’t prune back your plants, they’ll focus on growing foliage instead of vegetables. 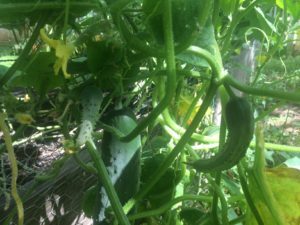 All those pretty, deep green leaves aren’t actually adding to the plant’s ability to produce delicious crops. I spent some time last weekend trimming back the tomatoes and squash. We’ll see if that increases the yield. On another note, this will be the final year for Veggie Garden Virgin. I started the blog two years ago to share lessons learned. I also hoped it would take off. Even though it never did, I had fun writing it. Looking back I’ve written less and less each year to only about once a month this season. I hope the blog has been helpful and somewhat entertaining. I’ll do one final post next month. Thanks for reading! In keeping with the ’90s* rap theme from last week’s post which was inspired by Notorious B.I.G., this week’s post is inspired by LL Cool J. I was sure my garden was in decline, but I was very wrong! 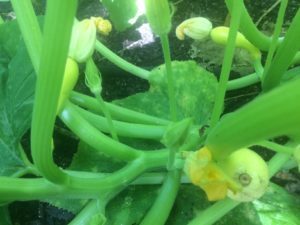 I’ve had some recent issues with my squash and cucumbers. The leaves on both plants were changing colors and dying. It also seemed like they were producing less. 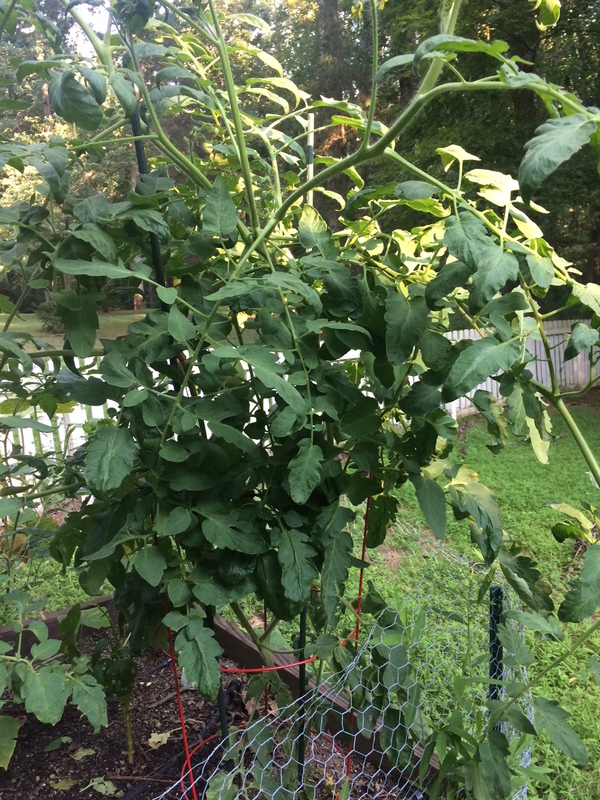 Based on a master gardener recommendation, last week I used fish fertilizer around the base of the plants. Looks like the extra TLC made a difference; the plants are now thriving. I’ll have to remember rather than panicking and jumping to worst case scenarios, to instead take a step back and be optimistic. This problem is why I concluded that Steve had early-onset Alzheimer’s when I saw he was watching the same movies over and over. I thought he’d forgotten that he had already seen the films. After calming down, I realized that he just likes watching his favorite movies multiple times. This is something I’ll definitely continue working on in the future. 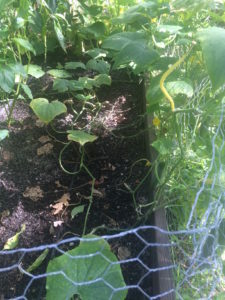 Anyway, photos of my growing squash and cucumbers below. *Notice how the decade for the 1990s is properly notated at the beginning of the blog post? 90’s here would not be correct since the usage is not possessive. Just a slightly unrelated rant because I recently saw “Stop in and try our hamburger’s” on a restaurant sign. When did plural become possessive?!?!? 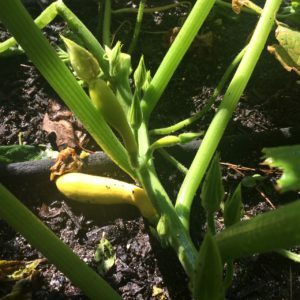 This year is the best by far in my garden- a great thing! 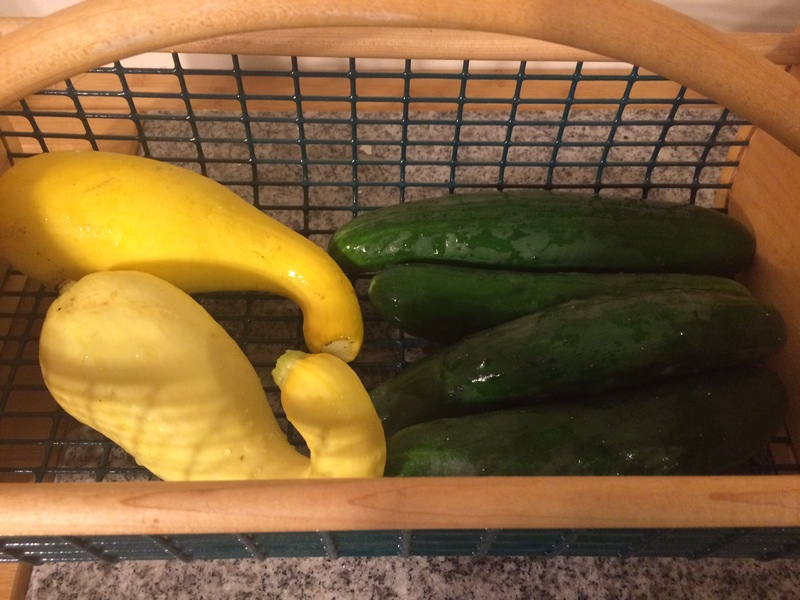 I’ve already picked more than a dozen cucumbers and a couple of squash. 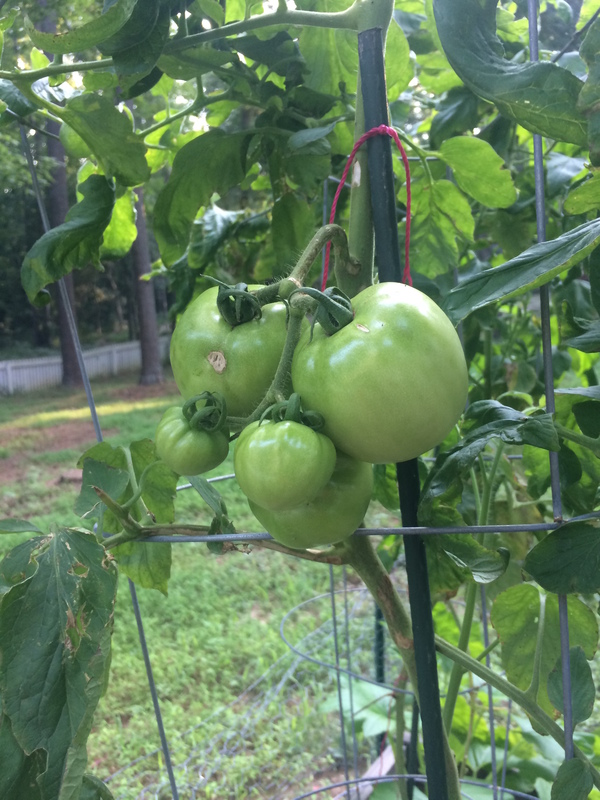 The tomatoes should be ripe by the end of the month. But like Biggie said, mo garden mo problems. Well, not exactly that, but something very similar. 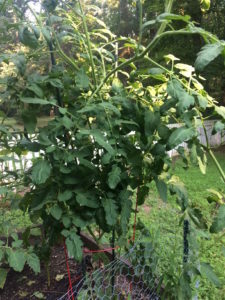 Bending and Snapping Tomato Plants- My tomato plants have gotten far bigger than I thought they would. I bought cages at the beginning of the summer to support them, but each plant is now at least a foot taller than the cage. Luckily this was an easy fix. I staked the plant by tying the main stalk of each plant to a pole with a string. 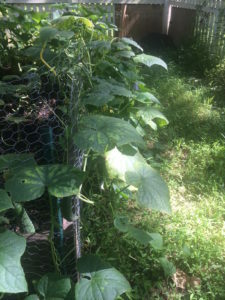 As the plants grow, I can use taller poles and retie the string to better support the plants. White Spots on Cucumber Leaves- I noticed several squash plant leaves had white spots or were covered in a white powder. After doing a quick search, I found out this was a fungus. There are multiple treatment methods, but I settled on a milk and water mixture because it seemed pretty effective based on feedback. Just spray on the leaves once a week and the problem should go away. 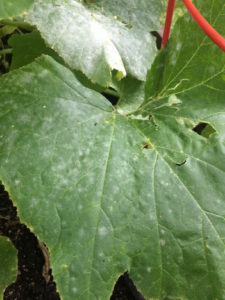 Yellowing and Browning Cucumber Leaves- Some of the leaves on my cucumber plants started turning yellow and brown, then dying. I had no idea what this was so I went straight to Google. This was about as big a mistake as going to WebMD to look up your medical symptoms. I found out the problem could’ve been anything to nothing to a rampant plant killing fungus. Much like what happens when I use WebMD, I jumped to the worst case scenario. My entire plant was dying. 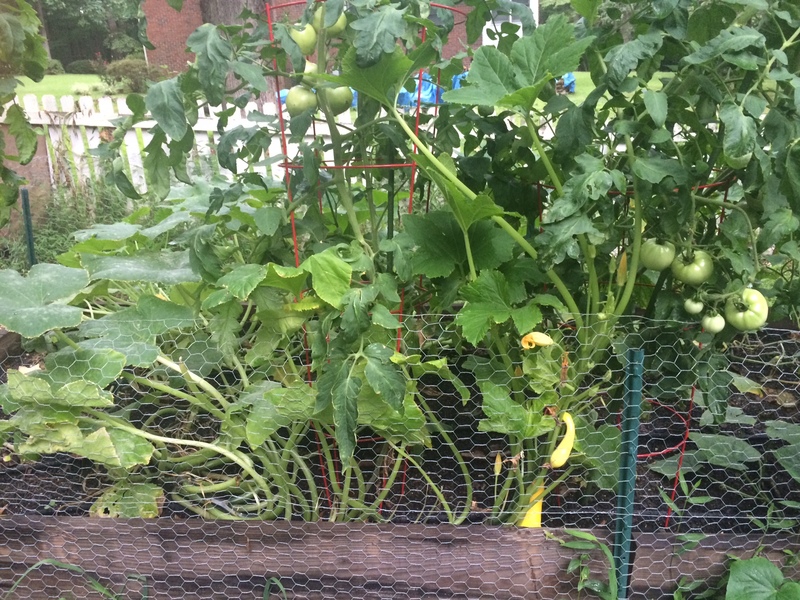 For a little extra help, I contacted Wake County NC Cooperative Extension Master Gardeners. Luckily, these experienced gardeners calmed me down. The gardener told me that the soil likely needed more nitrogen and recommended fish fertilizer. I purchased some and applied as directed. We will see if these remedies cure my garden problems. On the bright side, my crop over a two-day period this week.